Thank you to those who came to my workshop and/or came and said hello at the SAETA annual Conference on May 5. It was great to share with you the development process of my online Gone Dragon Journal series and to get your valuable feedback. I'm excited that some teachers are now using Gone Dragon - Book I as part of their year 9-10 English curriculum. The journals keep evolving as feedback comes from you and your young student readers - keep the questions coming! If you did not receive a journal pack at the conference, you can now download the Journal entries as PDY documents for FREE at any time. Just click here! Presentations start with that first slide! Thank you for your support! Thank you to everyone who came to my author talk at the Marion Cultural Centre on March 13. I was inspired by the feedback and discussions we had and I will be creating a few journal entries in response to this in coming weeks. It was great to share with you all the inspiration, creation and evolution of Gone Dragon - Book I, with a few select hints about the forthcoming Book II. For those of you who grabbed a copy of Gone Dragon on the night - I hope you enjoy the journey! What a fantastic evening at the Marion Cultural Centre on March 13. Thank you all for coming! T.P. Sheehan and the Gone Dragon were set up at the Cove Christmas Market, at the Cove Civic Centre, Hallett Cove, on Nov 26. Christmas specials for a Christmas market! This was a really good event. I was amazed at the number of people who came to this great little market and took the time to have a chat. Once again - I hope all of you who took home a copy of Gone Dragon really enjoy the journey! This was fun! It was great to meet people and thank you to Yvonne and Mark - you have a wonderful book shop. I look forward to seeing you again very soon. And for my new readers - I hope you enjoy the Gone Dragon journey! SUpanova comic con - adelaide! What a fabulous weekend! It was great to meet readers face to face - especially those who greeted us at the entrance gate on Sunday! I hope all my new readers love the Gone Dragon journey. And yes - we have Captain America's stamp of approval! What a blast! It was great to meet everyone at Supanova Adelaide! gone dragon promotion - FINISHED! Yep - this competition is finished. Congratulations to the winners - Roadie Unger and Riley King! 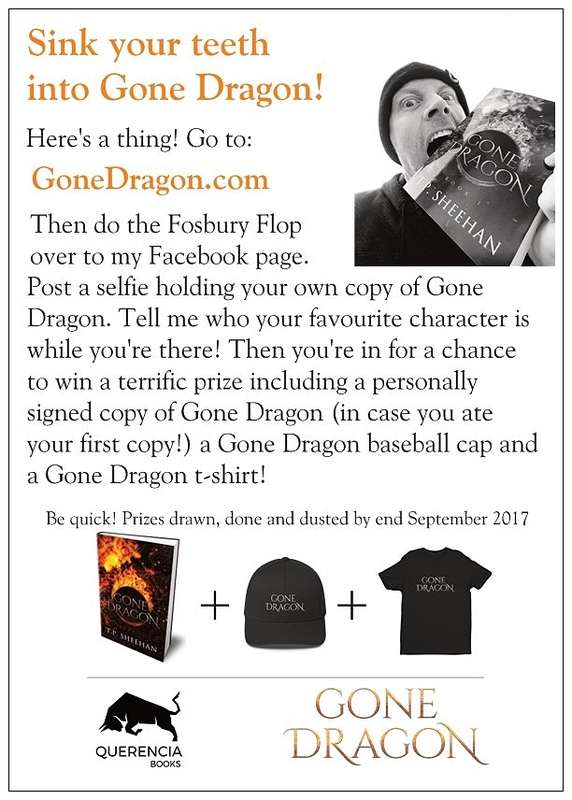 Win another Gone Dragon book, cap and t-shirt! Sink your teeth into it! 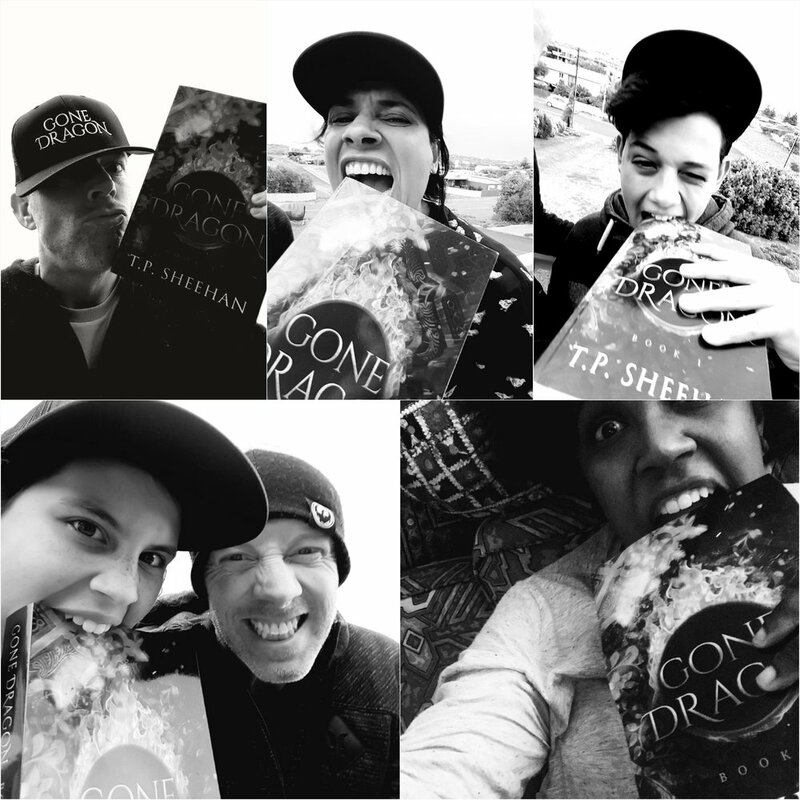 Sink your teeth into Gone Dragon! Have you got yourself a copy of Gone Dragon yet? A signed copy of Gone Dragon, a Gone Dragon cap and a Gone Dragon t-shirt! **Your pic will be posted on the Gone Dragon Facebook page! Be quick about it! Prize draw finishes end of September 2017.